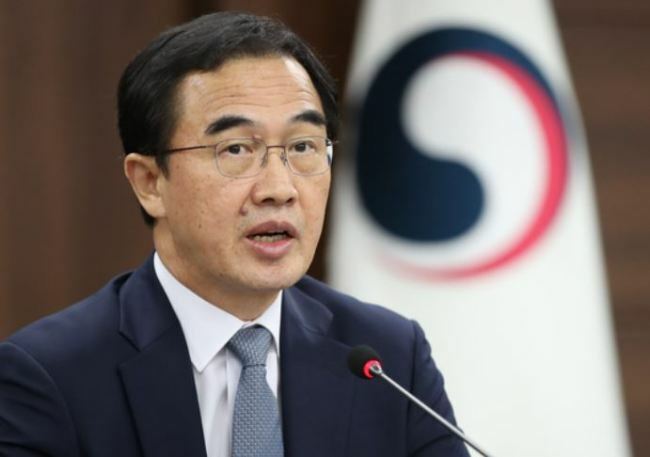 South Korea's minister in charge of inter-Korean cooperation will visit the United States next week to discuss bringing permanent peace to the Korean Peninsula, his office said Friday. Unification Minister Cho Myoung-gyon will visit Washington DC and New York from Nov. 13-17 to attend the 2018 Korea Global Forum and meet with US government officials and lawmakers, the ministry said. Cho is expected to meet with US Secretary of State Mike Pompeo to exchange views on the recent postponement of high-level North Korea-US talks and explain Seoul's position that improvement of inter-Korean relations would accelerate the North's denuclearization. He is also expected to ask the US government to have an understanding of inter-Korean cooperation projects, including the proposed connection of cross-border railway lines.